THIS NEW UPDATED VERSION IS AVAILABLE BY CLICKING HERE! 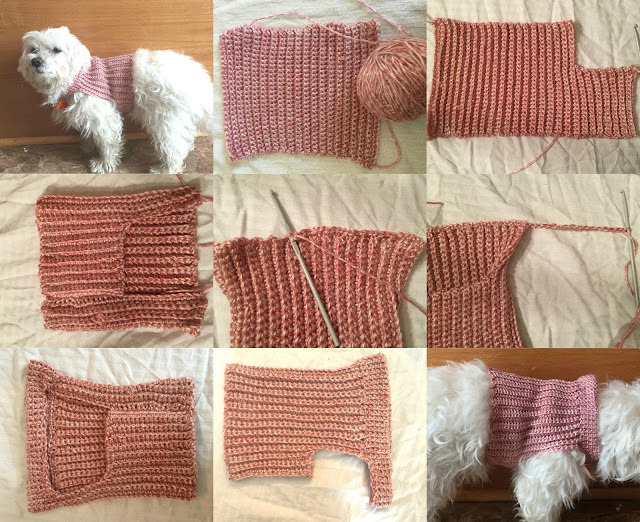 I started making this sweater just 3 days ago after being frustrated that every time I bought my maltese bichon puppy, Snowflake, a sweater it was too small , mostly in the arms. I thought he needed a little something since he gets cold when we walk him in the mornings, so I made a little sweater without arms! 2) Single crochet in second chain from hook and each chain across, turn. 3) Chain 1, single crochet in back loops only of each stitch. turn. 4) Repeat last 2 rows until your piece is the size of your pets back from the top of one leg to the other. 5) Now, when you are satisfied with the length, start from the bottom of your piece (the opposite of where you started) and single crochet in each stitch only until you almost reach your pets arms, turn. leave remaining stitches unworked. For me here, I did 8 stitches. 6) Keep single crocheting each row until your piece wraps around your pets tummy comfortably, but not too loose. For me, this was about 12 rows. Fasten off. For me here, I did 15 chains. 8)Now single crochet in each round until you have the desired length of your pets neck. Fasten off. Depending on your pet you may need to single crochet 2 stitches together so the neck will be smaller. Or you may want to make it really long and fold it over like a turtleneck. 9) Now, sew together the bottom part of your piece that goes around the tummy. Add some embroidery, sequins, anything you want. i was wondering if you can tell me how many chains to do for a 50 lbs dog? I couldn't tell you without knowing the measurements, but if you can get those I can help you out! hi silly question is the first chain 21 the width or length? chain 21 is the length from neck to tummy, then after that youll be working on the width with the single crochets n such. Just wanted to thank you for this very nice and easy pattern. It was easy to adjust to fit my Pug size and needs. I made this sweater for my chihuahua and i love it! My daughter suggested I add a piece to cover the chest so I crocheted in a strip 7 chain wide to fit the length of the opening. It looks and fits great. I'm so happy it came out for you :) thanks so much for leaving a comment and reading! I can't figure out#5, could you please help me? Love your pattern. Your little one looks so cute in it. Just have a couple of questions. In 4, how many repeats of row 2 did you do. I would like mine the same size as the one you made. I'm also assuming you do not finish off after the last row and proceed to row 5. Am I correct? Thanks looking forward to your answers. What an adorable sweater. The pattern seems very simple, too. I just have a question - what type of yarn did you use, please? Just out of curiosity, how much does your dog weigh? He looks about the size of my llasa apso. Figure if it's about the same size, I wouldn't have to make adjustments on the sweater. Fantastic, thank you it was so easy and it's the first thing I've ever made - I only learned 2 weeks ago. Please help me with #5 and #6. I cannot figure it out. Hi Mary Anne - thanks for reading :) in row 5 you are crocheting the part of the sweater that will go under your pets belly. Youll continue crocheting as you were before, but not the entire row. only crochet up until the sweater goes from the hind legs to almost behind the front legs, then continue crocheting until the sweater will wrap around your pet. does that help any? let me know - i know its a bit confusing, i hope to update the pattern soon!